Vintage-VDB are celebrating their tenth year of watchmaking with a special Project Black Ten Years production series watch, created in a Limited Edition of just 50 pieces. The watch which has a chunky-looking Stainless steel case with an all-black coating; I am not sure if that’s PVD or DLC to be honest. It measures 46mm in diameter by 17mm thick with a lug-lug measurement of 56mm. The watch is listed as having a water-resistance of 200m but looks like it could handle a lot more. Powering the Ten Years watch is a Swiss made ETA 2824-2. 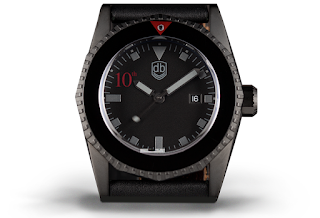 Special features include a red 10th logo on the dial and matching red 12hr bezel marker. MSRP is 1590€. Follow the link HERE for more info.